Note: Before his imprisonment Paul had spent over two years preaching and ministering in the city of Ephesus. This city was one of the three most populace cities of the ancient world, and its temple of Artemis was considered one of the Seven Wonders of the ancient World. Artemis was a fertility goddess of the time. Holy Spirit – vs. 1-7 — In Ephesus the Spirit was present, but believers needed to experience the Spirit in their individual lives. As immersed believers they had the Sprit, and with the apostolic blessing they had the miraculous power of the Sprit. Evangelism – vs. 8 — Paul remained in Ephesus for the purpose of evangelism. He wanted to reach the world. If only the leaders of the church would desire to reach all in their community today, the world would begin to change for Christ. Asian Province – v. 10 — Paul remained on in the province for more than two years, and with the help of other Christians many more were won to Christ. The text says all heard. Have all within our community heard the good news? Remarkable restoration – v. 11-12 — In the Christian community under the leadership of the Apostle Paul individuals were restored to health, sanity, well-being. Today’s church should be a womb for remarkable restorations. Demonic Deliverance – v. 13-22 — Demonic powers continued to hold sway over the lives of many. They feared Paul as an adversary, but the hypocritical were no match for their powers. Today we must know where we stand if we are to deal with the forces of evil. Only if we prove to be genuine followers of Christ can we withstand the demonic spirits of the world. Exemplary story: Pigeon Forge is a popular resort town I have visited. Family and friends relish trips there, since it boasts many souvenir shops. The town’s economy is driven by its tourist trade. Ephesus was a resort town, and its main attraction was one of the seven wonders of the ancient world, the temple of Artemis. Visitors could buy charms and trinkets from the temple that honored the goddess of fertility, Artemis. 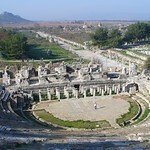 When Paul brought the Gospel to Ephesus, the very economy of the town was in jeopardy. People began to abandon their preoccupation with the worship of a goddess of trinkets for the worship of Jesus, the Son of the living God. Blood that bonds – v. 13 – Ever watch an old western? You might have seen the ceremony of two men becoming blood brothers. When we were immersed into Christ we became brothers and sisters by a bond of blood. Unity – v. 14, 18 — There is a strength in unity, and there is a unity in the body of Christ. We are united with Christians across the world, and we are united with Christians through the ages. The voices of Christian leaders echo over the ages. They thrill us with their love of God. They shame us with their absolute devotion. Intertwining – v. 19 – In Christ we are a body knit together. The aches and pains of one are those of the body. 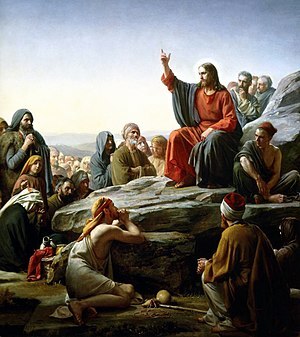 Leadership – v. 20 – The church is built on one cornerstone, Christ. Its support is the apostles and prophets. As I rest my hand on the Bible with its New Testament I have the apostles with me. They are no farther than arm’s reach. These apostles – Matthew, Mark, John, James, Peter, Paul – and these prophets – Luke and the writer of Hebrews – still offer that leadership and order that the church needs. Dwelling – v. 22 – When Jesus left, he gave a promise that he would send the Comforter. That Holy Spirit abides in the church, since we are intended to be the dwelling place of God. When the sick, poor, and lonely turn to the church for refuge, the church must respond in the loving spirit of Christ. Exemplary story: No doubt you have heard of how Sam pieced together the map of the world. For her geography lesson one teacher distributed to her pupils copies of a world map from an activity book. The teacher cut each sheet of paper into a dozen or so pieces. She asked her class to reassemble the map. The challenge seemed formidable. Sam completed his puzzle first. The teacher praised for his accomplishment. Then she asked how he had finished his work so quickly. He replied, “I just put Jesus together and then the world fell in place.” Sam saw something the teacher had overlooked. On the reverse side of the map was a picture of Jesus.